At Systematic Facility Solutions we believe in giving back to our community. We are committed to helping non-profits improve the lives of others. In addition to supporting organizations with money and service, We make a difference with our time. The Systematic Facility Solutions culture is one that emphasizes our role in the community and the importance of our involvement in non-profit organizations. 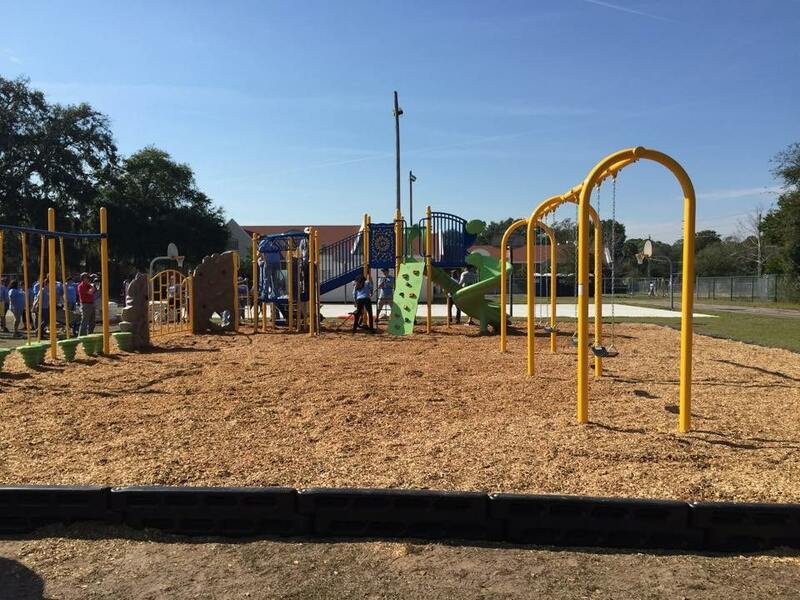 In January of 2015 we had the honor of being a part of building a playground for the kids at Long Branch Elementary School in Jacksonville, FL. Communities In Schools partnered with KaBoom! to make this wonderful event happen. There were over 250 volunteers helping to make this project a success in just one day of building. Not only did we build an entire playground in one day, there were also side projects that other teams were responsible for. I was amazed at how well KaBoom! coordinates these events. Day 1, Orientation Day: We were each assigned to teams based on our preference and then team captains were chosen. There were individual teams for both large segments of the playground and for side projects. I chose to be on team bear, which was responsible for the primary playground build, I also had the honor of being that team’s captain. After teams were established we got to work prepping for build day. The first task was to empty the shipping crate that was in site before we arrived. The crate included anything you could think of for our project, wheel barrows, rakes, shovels, etc. I’ve never seen so many wheel barrows in one place, there were at least 50 of them. Many of us were given lists and bags/buckets and were to inventory and separate tools necessary for each team’s assignment. After we organized our equipment the truck arrived with the playground. We unloaded the semi-truck and re-loaded the playground into the storage container. 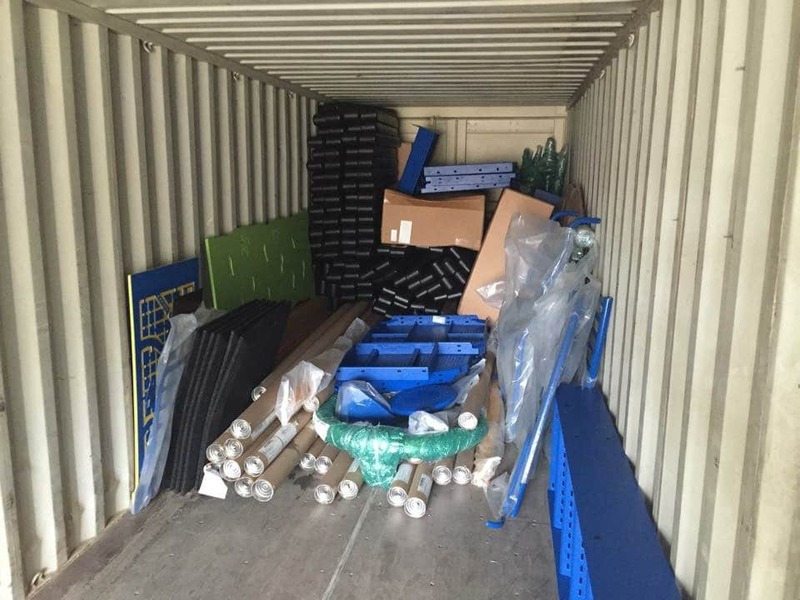 We then loaded all the equipment back on the container. Day 2, Build Day: Before dawn we began our day. As you can imagine, this was a very fast-paced day. Our first step was to distribute the equipment and playground parts to their appropriate staging location. Each team was given a full set of drawings specifically for their assignment. As my team began to complete construction of the primary platforms for the playground other teams were also completing their projects and started bringing us their segments to be bolted on. Behind them came the concrete crew filling in all the support beam holes followed by the mulch crew. At the end of the day we completed the entire project in just under 8 hours. And the best part? Watching the kids come out after class and be presented with this wonderful new playground. Needless to say this was a very rewarding experience.